WHEN IT comes to controlling the cue ball, speed is obviously an important factor. But for this month, let's focus on going off a rail. 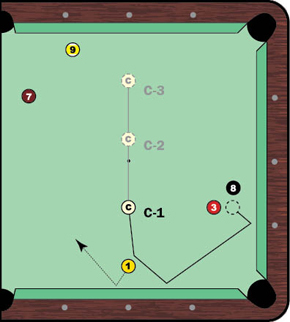 Looking at the situation in Diagram 1, you're best bet is to hide the cue ball behind the wall formed by the 3 and 8 balls on the short rail. From cue-ball location C-1, you shouldn't have too much trouble getting a feel for the speed that will put the cue ball in a safe place. But think about the angle you take off the 1 ball. Experiment with how much left English you will need to send the cue ball off the 1 so you get the proper angle off the long rail. I'd suggest you start hitting the cue ball with a tip to two tips of left English. Just barely hitting the short rail will greatly increase the effectiveness of the shot by tucking the cue ball as close to the blockers as possible. Thanks to the left English, the cue ball will pick up a bit of speed when it comes off the long rail, so be sure to adjust your power accordingly. While you start to get a feeling of how varying degrees of English will change the cue ball's path, you can also play with how fully you hit the 1 ball. If you hit the object closer to completely full, you will need more English to open the angle of the cue ball off the long rail. When you can really master the safety from C-1, challenge yourself further by bringing the cue ball back to C-2 and C-3. You'll see how the added distance between cue ball and object ball will complicate the shot. Also, try this situation on the other side of the table, so you have to use right English. If you can get a hang of this example, you'll be more dangerous, whether your moving the cue ball to play safe or into position for your next shot.